<?xml version="1.0" encoding="UTF-8"?><md>Hi Houzzers. 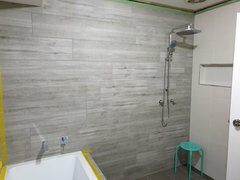 Just getting to the end of our bathroom reno and wanted some advice on accessories and styling please. 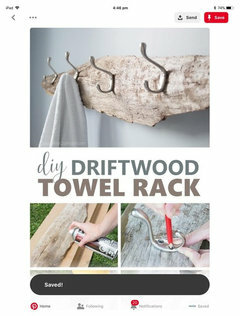 Mainly for a towel rack and where to put it. Trying to achieve a modern day spa/relaxing look. Also we have 3 young children so there are always towels around which need to be hung up to dry. 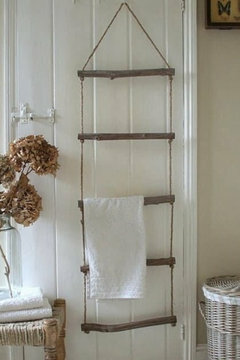 Not really interested in a heated towel rack- we have one in the ensuite and hardly ever use it. 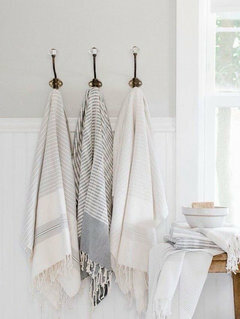 I've looked online and on Houzz for ideas but there aren't many photos which show towel racks, or toilet paper roll holders, etc. I have a wooden (teak I think) stool which I'll be putting in there. Not the one shown in the photo! I don't know why the rest of my post didn't show up or even my photos! Sorry. With 3 young children you need something sturdy that won't topple over. Perhaps a visit to bathroom showrooms might give you some ideas. Thanks for your advice. I'm leaning towards the fixed option for the towel rail as I'm worried about my 4yo son climbing a ladder. Maybe something off centre over the bath that both adults and kids can reach? Maybe 2 or 3 separate rails? Not sure. Any other styling ideas? Thanks again. 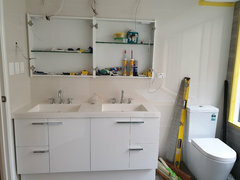 oklouise, I have an open side cabinet which will go beside the vanity where I will store rolled up towels. 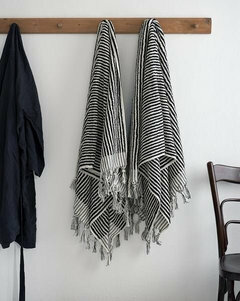 So now it's to decide whether something free standing or on the wall to hang wet towels. As mentioned in my previous comment, I'm worried about my son climbing those bamboo ladders. 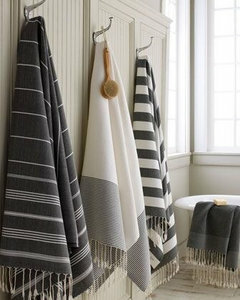 Plus do towels dry ok with those from your experience? You obviously need to fold your towels for them to fit on the ladder so I'm wondering how effective are they? Thanks again. oklouise, and yes we have an old painted wooden stool which my kids have used for years. I'll probably sand it down to natural wood as it's currently a faded pink! lol. 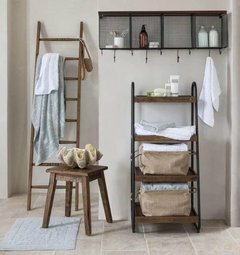 Maybe hooks could be the answer, I have swapped our towel rail for something similar to these , the towels seem to dry better than folded on the rack, a small stool for your little ones as oklouise suggested is great so they can reach them and hang them up after use. What areas do you most need decorating advice/suggestions on?